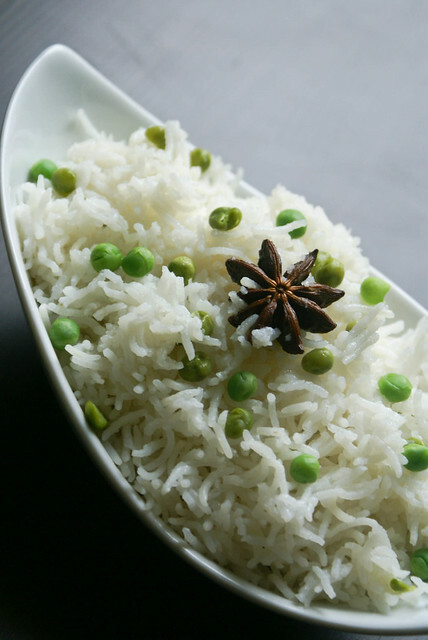 It is a nice combination of peas and rice, with ghee and spice giving the flavour and adding the magic!! Wash rice multiple times till water runs clear. Soak rice in water, and keep aside. Heat ghee in a pan and add all the spice from ShahJeera to Black Cardamom. Saute for few seconds till the spices sizzle and give a nice aroma. Add in green chillies and ginger. Saute for 2 more mins. Add peas, and cook for few mins till soft. In a rice cooker, add drained rice, water and milk. Add in the peas and spices. You can even add a small onion depending on your taste, if adding onion, slice it finely and add it to ghee along with green chillies. Adding milk, retains the white color of the rice. Adjust the water quantity according the rice you cook.If you rice takes 1(rice):1.5(water), then for 2 cups rice add 2.5 cups water and half cup milk. This might be the most simplest pulao but I love it so much even i make this often here at home. Thanks for dropping by my blog. You have a wonderful space here with pretty pictures. That looks like gourmet meal! I love how single the grains have cooked..visual treat. beautifully and yummily presented…very versatile….I like it that i mak eit so very often! 🙂 thanks for dropping by my blog! simple yet so very divine! I usually saute the spices and add rice to it and cook and add peas at the end..its nice to know different ways of making the same things! 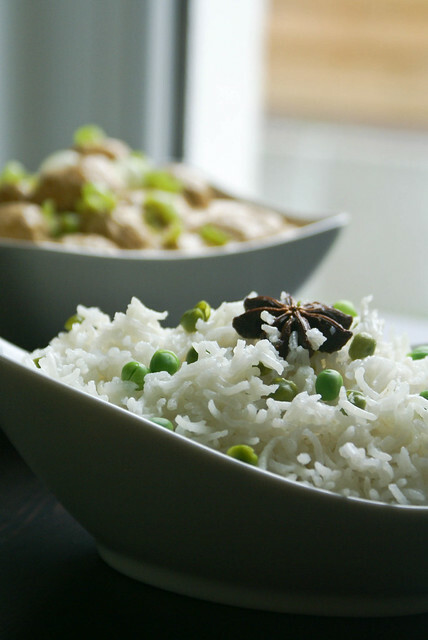 Peas pilaf is always a simple yet exotic way to pair with some spicy curry. It sure is… howz ur vacation going on? or are u back? I am glad you liked it Sonali.. Your blog is very unique .. i have to try some of your recipes.